China is a country with 82m children below the age of five, and where only 28 per cent of children under the age of six months are breast-fed, according to the UN, any problems in the supply chain were always going to have far-reaching effects. Demand of milk for babies has soared amid the fallout from China’s scandal over melamine-contaminated milk in 2008, which killed six babies and left hundreds of thousands sick. 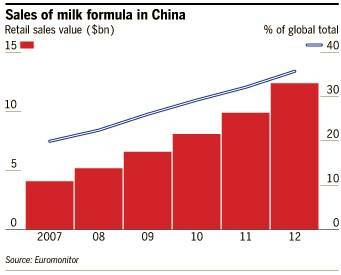 Euromonitor projects that Chinese demand for formula will double over the next four years to $25bn on the back of reduced breastfeeding and a growing female workforce. By 2017, the data agency forecasts that China, the one-child policy notwithstanding, will account for half of all global sales. To find a good supply of high quality milk chinese companies are looking abroad. In Europe for example, Mengniu, caught up in the initial milk scare, has been restructuring in an attempt to improve its image. it agreed a joint venture with Danone of France, which is already a big operator in China’s market. Synutra midsized operators of infant formula recently started a project for $118m milk-drying plant in France. Danone in France and Milupa in Germany have both increased European production in an effort to avoid European shortages, as well as to serve the Chinese market. Danone has also been selling its Dutch-made formula online in China through a partnership with Tmall, an online retailer owned by Alibaba. Italy as well, with its high quality of food and a large and structured diary sector, is positioning itself to become a land of opportunities for China companies. Lombardy especially emerges as the most relevant market. With an excellent transportation system on road and a capillary network of road it allows the farmer to deliver fresh milk to the main diary hub in few hours. Among the opportunities that China is seizing there is the new agreement signed between Sterilgarda (and the Consorzio del latte di Brescia), the food company of Castiglione delle Stiviere (Mantova), and Yili Group, the a major dairy producer in China. Thanks to the partnership agreement signed by Sterilgarda and Yili, the milk of the Italian company will be sold on the Chinese market with the Yili brand.